BYD completed delivery of six electric buses for the Netherlands' first National Park in the province of Friesland, Netherlands. The six vehicles, to be operated by regional bus service Arriva, recently entered service. The vehicle contract was awarded last June 2012 in Europe's first publicaly tendered order for electric-powered full-size buses. BYD's Electric Bus model is a full-size, 40-foot transit bus, which can accommodate 60 to 70 passengers. Powered entirely by the company's advanced Iron Phosphate batteries, the buses can be charged at night and, with a range of approximatley 155 miles per charge, they can provide service all day without needing another charge, according to company data. 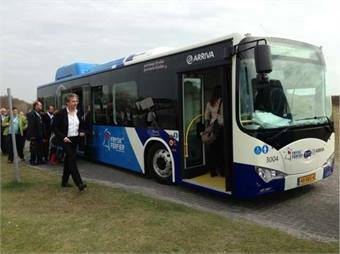 The Friesland-based National Park has become one of the first places in Europe to entirely convert their public transportation to zero-emission, electric buses. BYD has entered into a 15-year maintenance contract to support the buses in service and will be employing locally recruited mechanics to undertake the work. The specially designed wheel-hub motor and the electronically controlled air suspension give the BYD ebus an exceptionally low floor and ample door and floor space for easy disabled and elderly passenger access. The front windscreen occupies two/thirds of the frontal area of the bus for maximum viewing and safety. The bus body conveys an elegant exterior image, while the interior boasts adjustable leather drivers seating, high-quality leather seats for passengers and a carefully engineered sound insulation keeping the interior ride whisper quiet. BYD's first pure electric bus also employs many advanced technologies. The Iron-phosphate or "Fe Battery" used on the BYD ebus is non-polluting: the materials contained in the battery can be recycled or easily disposed of. 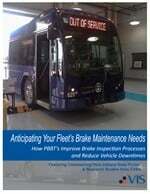 The bus has no direct emissions, very low noise, regenerative braking, full AC charging in five hours.